Ontarians to Vote Saturday May 28 ? ? ? ? ? ? ? ? ? ? ? ? ? ? ? ? ? ? ? ? ? ? ? ? ? ? ? ? ? ? ? ? ? ? ? 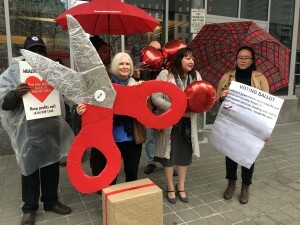 (Toronto, ON) – People all across Ontario will be asked to vote on whether they want local hospital cuts to continue or be stopped, the Ontario Health Coalition announced in a press conference this morning in Toronto. Local health coalitions held media launch events in tandem across Ontario. More communities are joining in every day and there will be a second round of launches next Monday. 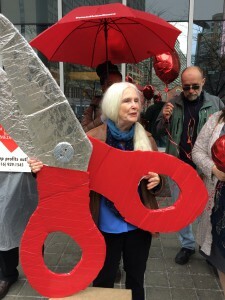 As Ontario heads into the ninth consecutive year of real-dollar budget cuts to community hospitals’ global budgets, the public is overwhelmingly opposed to the hospital cuts that are biting deeper and deeper every year. The Ontario Health Coalition has been working with hundreds of community groups to hold town hall meetings, launch petitions, bring delegations to the Ontario Legislature and hold rallies. While we have, collectively, saved a number of local services, in general the cuts continue. The challenge in this referendum is not getting people to vote in support, but rather getting huge numbers of votes.? 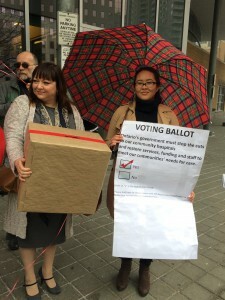 To do so, hundreds of volunteers are organizing workplace votes in the weeks leading up to Saturday May 28, dropping leaflets off around their neighbourhoods and communities, and asking for volunteers to help staff voting stations on the big vote day. Ontario is currently in the longest stretch in Ontario’s history. These cuts mean that hospitals across the province cannot keep up even with basic inflation. Hospitals have been cut to the point of dangerous overcrowding and understaffing. Emergency departments are backlogged, wards are full, patients are discharged when they are too frail and re-admission rates have soared. We are calling in the provincial government to stop the devastating hospital cuts and improve hospital funding to at least the average of the other provinces, and also to ensure our health care dollars go to direct, front-line patient care and vital support services. Click here to view on Facebook.